After a painstaking three month delay, we welcome everyone back to the fifteenth installment of the AsiaFortress Cup! Having made huge changes, make sure all of you read to the end of the post to ensure you don't miss anything out. With that, let's kick start the list of changes. To keep the map pool fresh season after season, we want to keep experimenting with new maps. Therefore, this season, we are introducing cp_propaganda_b14! We will also be welcoming back to the map pool, an updated cp_reckoner_rc4a which hasn't been played since AFC11. Make sure to start practicing these maps. In their place, cp_sunshine and cp_granary_pro2 have been removed from the mappool. Whitelist changes are inclusive of the banning of both The Scorch Shot and the Detonator, in accordance with the global whitelist update. Other than that, there will be no major changes to the whitelist. We are always trying to improve user experience and with the gracious provision of match.tf services, we are experimenting on doing just that. For AsiaFortress Cup 15, the match system will be ported over to match.tf! We hope this will allow for a smoother registration and score submission process for both present and future seasons. Signups are open until the 24th of March! Roster sizes are still limited to 10 players, with a minimum of 6 players required to sign up. Captain bans and player bans found on the list here still apply. Do note that as this is our first season utilizing the match.tf system, technical difficulties are bound to happen. We ask for your understanding as the AsiaFortress Admins learn and fine-tune the system. Thank you. So what are all of you waiting for, head over to match.tf to sign up now! Happy New Year everyone! As we enter 2019, the AsiaFortress Administrators have big news so make sure to read the entire announcement. Firstly, our friends at serveme.tf have graciously provided us their services and you may now visit their site to book servers for scrims/future matches. The server is publicly available. However, to request for a private channel, follow the instructions given in the #mumble-queries text channel on our discord. The channel will also serve as a communication point should the server crash. The IP (35.198.221.251:27015) is also tied to an MGE server called "The Aquarium". Looking to expand to SOAPDM in the future. Finally and most importantly, we have set up a crowd fundraiser to make up for the costs community member Rednexela bore by spearheading the organization of AFLAN18. Make sure to donate if you enjoyed the event and want to make up for the deficit! Donate here. The AsiaFortress Administrators would like to thank everyone for another great year of competitive TF2 and we hope to see everyone in 2019. 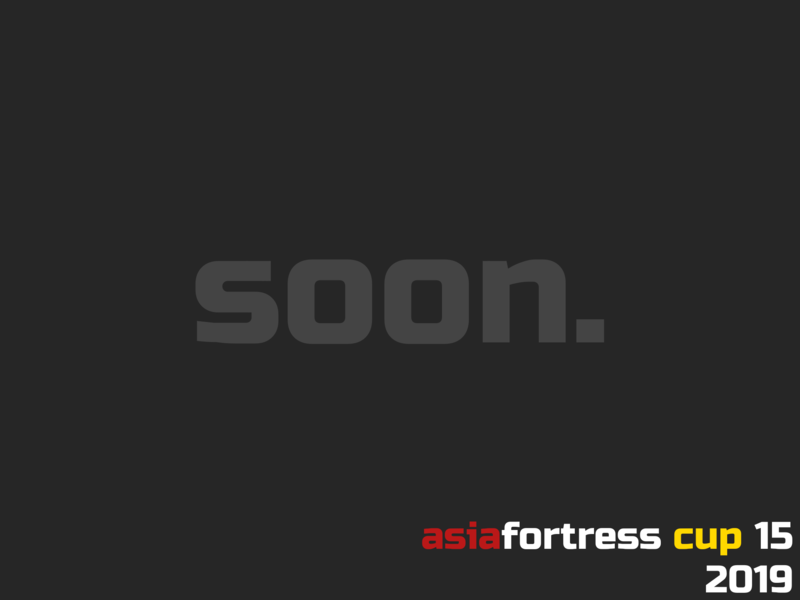 Make sure to keep your eyes peeled for the upcoming AsiaFortress Cup 15 announcement. Congratulations to these teams for making it through to playoffs! The second transfer window for AFC14 is now open! This is your last chance to (reasonably) upgrade your teams before playoffs. Head over here to apply.